Location: The church is set at the centre of the nucleated village, in the sub-rectangular former bailey of the castle, with a motte at the N corner. The motte is a scheduled ancient monument, 6/2203/Mg117. 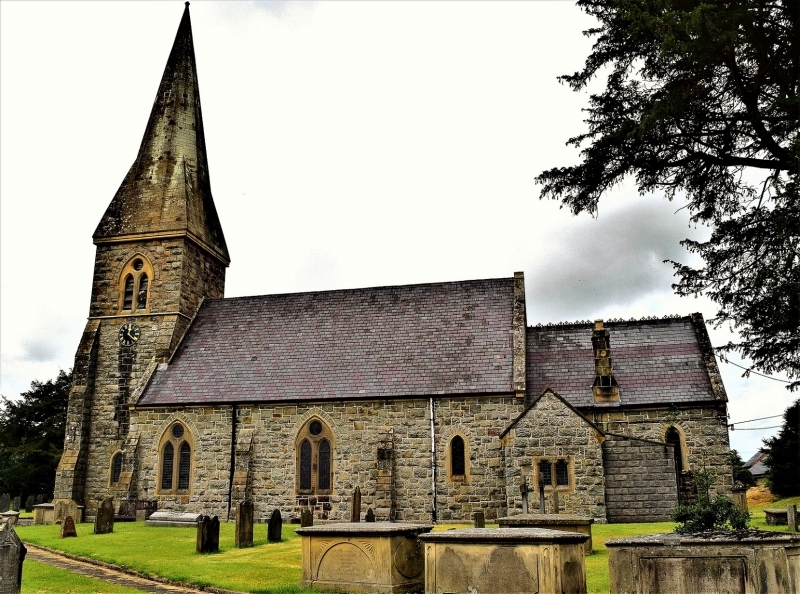 The church, which replaces a single cell building of the C15, is set in the centre of the embanked area of Twmpath Garmon, the castle built in 1156 by Madoc ap Maredudd, King of Powys. The present church building was designed and built by T.H.Wyatt, the diocesan architect, in 1866 at a cost of £1762 5s 7d (£1762.38), and a steeple added at the W end by Thomas Batt in 1878 completing Wyatt's design. The church was further restored in 1898. Built of squared green rubble stone with limestone dressings and a slate roof. Nave of 3 bays in Early English style, with 2-light plate tracery windows, offsetting buttresses, ashlar eaves course and coped gables. Narrow short chancel of similar materials, with 3-light plate tracery E window, and an added organ chamber on the N, with the heating chamber below. A vestry, also added, is set at right angles on the S. The later tower at the W end is of a darker stone, and incorporates the entrance porch in the tall lower stage, with a bell stage above a limestone string. Angle buttresses. The W door is of 2 chamfered orders and 2 trefoil-headed lancets over. Imposing plain broach spire with a terminal cross. A small stair tower is set in the NE angle, with a shouldered external door and octagonal top. A clock face appears on 3 sides of the tower, inscribed DUW A DIGON. The internal door to the church is of 2 chamfered orders. Nave of 5 roof bays, the exposed collar beam trusses have cusped braces carried down to wall posts and corbels. Cross braces appear above the collars. The walls are plastered. The chancel is raised by 2 steps and has a panelled wagon ceiling painted with stars. The sanctuary is raised a further step and paved with encaustic tiles. Alabaster reredos carried across the E wall, with 3 carved panels set against gilded mosaic work. At the W end, a raked galley carried on 4 posts with pierced timber spandrels. Glass: N window, of 1871, SE lancet, the Good Shepherd, by Abbott of Lancaster, and a geometric foliage window of c.1840's by David Evans of Shrewsbury. Fittings: Font; Octagonal with inset trefoils. Pulpit; Oak, open traceried octagon directly accessed from the vestry. Pine pews, but oak in the chancel. Moulded sanctuary rail on brass plated iron stanchions. Organ by Greeenward of Southsea. Bells: Three, one of 1628 and one of 1637, one a late medieval bell recast by Mears of London. Monuments: In the chancel, S wall (a) Oval ivy framed tablet on grey to Mary Jones of Coffronydd (sic), later wife to Thomas Brown of Mellington, d.1810. N wall: (b) white marble in veined black marble surround, to Noel Turner of Sylfaen, d.1915. In the porch, (c) white on grey marble, corner acroteria and pyramid, to Edward Loyd (sic) of Trefnant, d.1819, the primary inscription absent. Two black marble Commandment tablets either side of the altar, and 2 similar charity tablets are set in the porch. In the gallery, a fine mantled royal arms, with lion and unicorn supporters. Miscellaneous: An unfixed brass of 1700, the church muniment chest of 1758, inscribed WI and RR, churchwardens, and a C17 chest. Included as a landmark building at the centre of the village, in an important setting within the historic castle precinct and Conservation Area. II Sundial in churchyard, Church of St Garmon. The sundial is located in the graveyard, approximately 5m SW of the SW corner of the church tower. Located at the centre of the village on the perimeter of the churchyard, and a short distance E of the E end of the church. Located at the sharp bend at the N end of the village where the road departs from the perimeter of the churchyard. The building lies near the centre of the village, approximately 100m SW of the parish church. II Pen-y-llwyn, also known as Penllwyn. Located on a platform site, SW of Castle Caereinion village, and reached by a rising track from off the B4385, approximately 400m S of the church. The farmhouse stands approximately 200m back from the main Welshpool to Machynlleth road, at the E end of the farm buildings. Located on a platform site adjacent to the by-road leading SW off the B4345 to Berriew, S of Castle Caereinion.